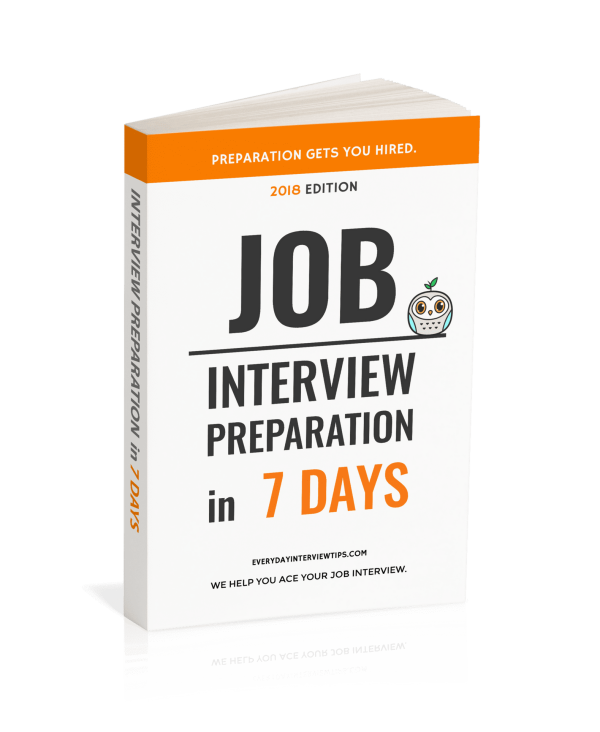 Get Ready for Your Job Interview in 7 Days! 90 Pages to Get You Hired! 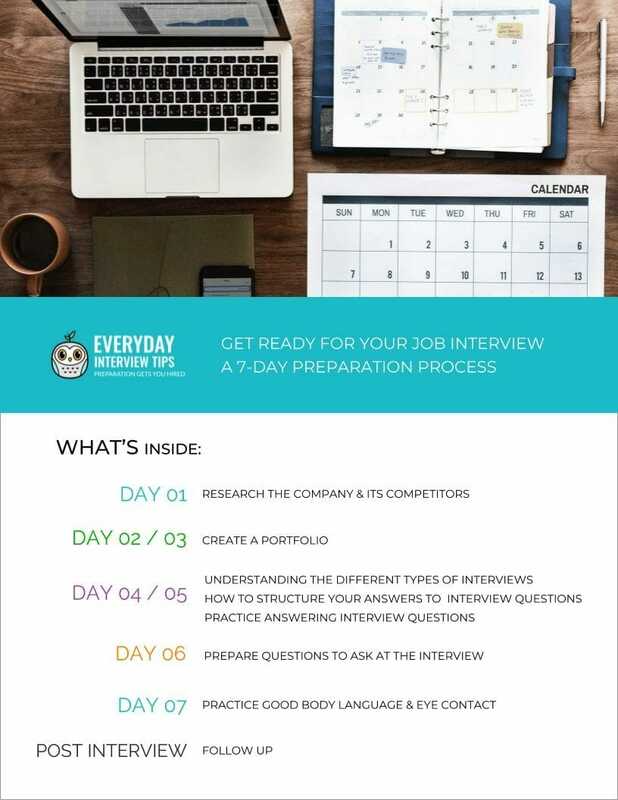 This guide is specifically created for anyone who has a job interview in less than a week. 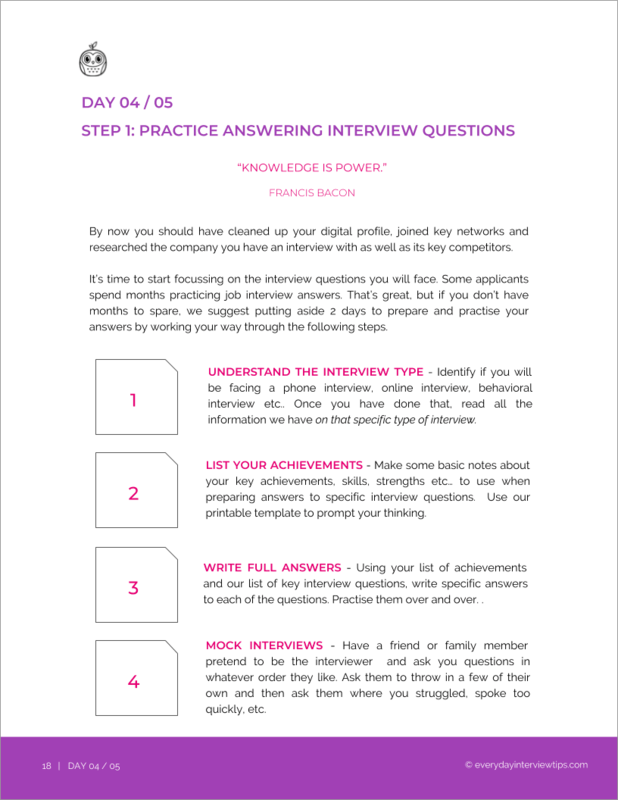 This guide covers many different types of interviews from Phone Interview, First Interview, to Second Interviews. If you get this Guide and tick all the boxes, we assure you that you’ll be more ready than other candidates who did not prepare. Got an interview next week? We’ve prepared this comprehensive Get Ready In 7 Days Guide to help you get ready literally within a week so you can ace your job interview. We detail the activities each day for you to have an action plan from preparing the different types of interviews through to having interview questions and answers. Are you prepared to answer behavioral interview questions? We have 13 prepared checklists for you to get ready. I just wanted to say thank for the fantastic guide. I’m so glad I bought it, I got through to the second interview!!!! Fingers crossed I get the job. Without your guide the only thing I would have done to prepare for my interview was a bit of background research and practice some basic questions and answers. Instead I was completely prepared when I walked into the interview which was lucky because they focused on the behavioral questions you listed. Getting ready for my interview while working full time was so stressful but I got through it by sticking to your 7 day plan and completing each task every night. I’ve just signed my letter of offer and resigned from my current role and I couldn’t be happier. Thank a lot guys.